Week 48 – It’s what we don’t talk about that hurts us. I woke early one morning last week to find the sun streaming through a maple tree outside my bedroom window, one of the last to hang on to its lacy yellow hands. As the rising light illuminated the leaves, I thought of my dad. I’ll never be able to share the beauty of this earth with him again in this lifetime I realized as I lay in bed taking in the late autumn show. Grief is like a shadow you can’t shake. As I go about my daily routine, one minute I feel normal as I drop packages off at the post office or pick up food at the grocery store. The next, reality hits and I feel bowled over by a wave of sadness that rushes through me, leaving behind a hollow space in my chest as the pain retreats. As difficult as grief is, there’s also something beautiful about tending to this experience in my life. Grief invites presence. These days I find myself walking slowly and deliberately through the day, noticing the nuances that make life special – a mom on the street talking sweetly to her little boy, or the way sunlight dances on the reservoir behind our home. Along with my sadness, I also feel like I’m living in a state of appreciation. I’m grateful for friends who check in and for those brave enough to look death in the eye and ask about what it feels like to lose a father. I spent so many years worrying about him and his failing health that his passing has left a giant hole in my consciousness, a space that I hope to fill with memories and a new kind of relationship that transcends this physical world. In the meantime, I’m realizing that we’d all benefit from making grief a friend instead of an enemy. 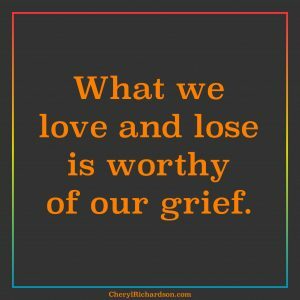 We’re so afraid of death and loss – an inevitable reality for us all – that I feel the need to write about it here in the hopes that it alleviates some of the fear. Grief is healing. Necessary. Important. What we’ve loved and lost is worthy of our sorrow. I’m learning to embrace it as a new part of my world, to include it in my conversations, and I invite you to do the same. After all, it’s what we don’t talk about that hurts us. Here’s a bittersweet video of a father and his daughter singing one of my favorite songs. You can watch it here.